I am making a setting to hold a coin. Or I am trying to. 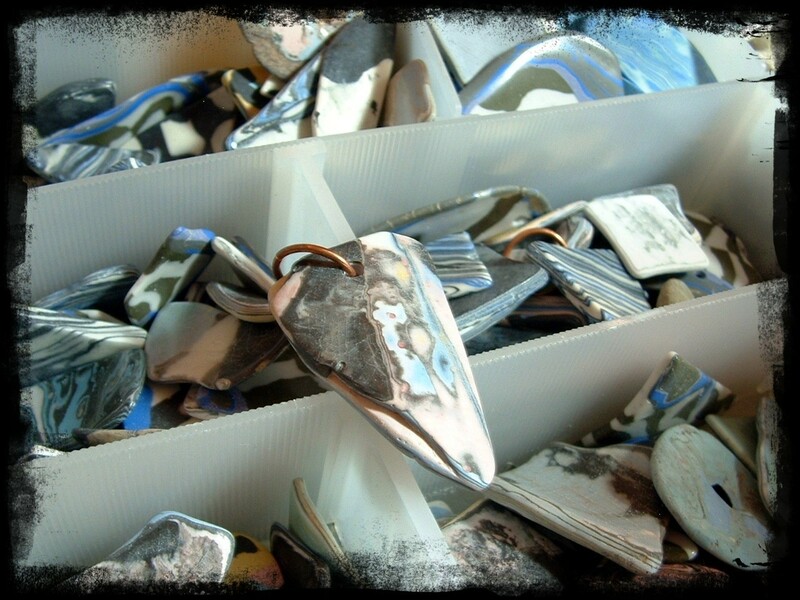 I set a coin in Richard Salley’s metalsmithing class at Hacienda Mosaico a couple of years ago. 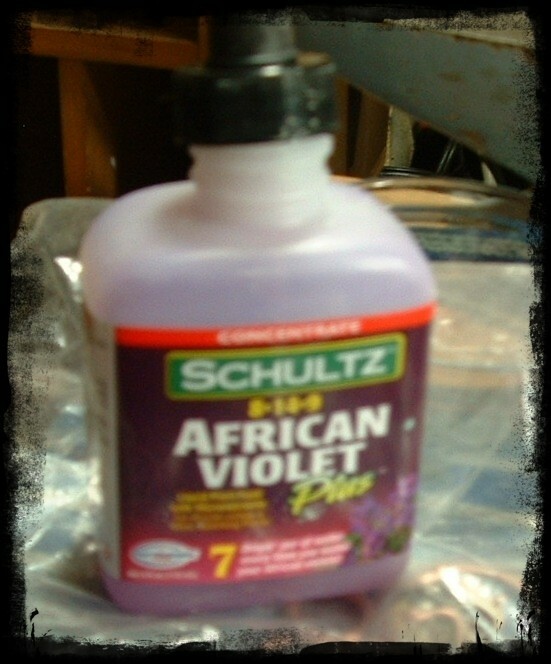 I didn’t like the results and vowed to try again. I had my class notes but wanted to find something a little more tailored to my capabilities. And so I looked for a tutorial in every dog house, out house and waffle house and didn’t find anything I like. So then I decided to improvise. Uh oh. This is the coin. A lovely specimen (from before the time the Republic of Ireland went on the Euro) that a friend gave me so I could make the pendant for his wife. I would love to show you the other side, but I have lost it. My husband says it will turn up somewhere. Brilliant. 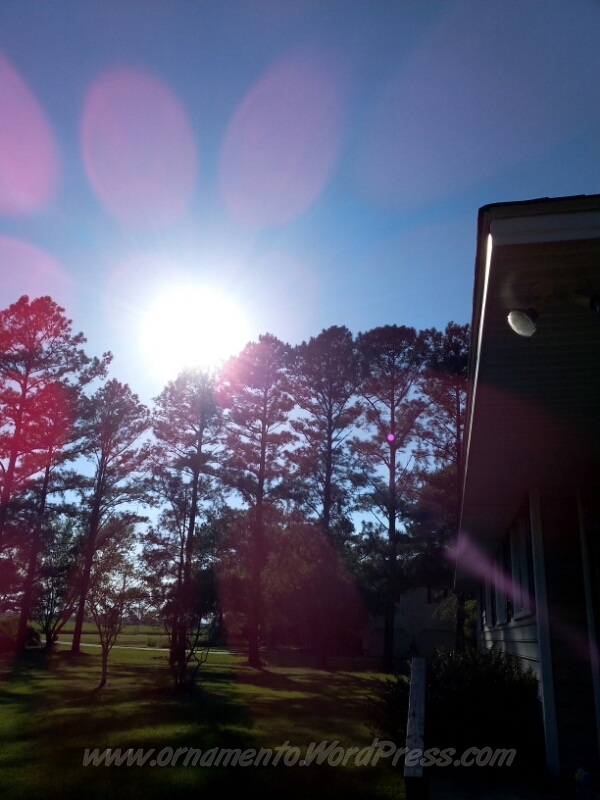 Maybe on one of the moons of Jupiter or the other side of the state, but not with me. My trusty scribe and metal cutting scissors. By the way, these scissors are fantastic! I forget where I read about them. (Maybe Helen Driggs’ column in Lapidary Journal Jewelry Artist?) I have a few pair of metal cutting scissors, but these are the best by far. You can buy them from Amazon. And phooey phooey phooey! But his story has a happy ending! I managed to design a coin bezel based on a basket setting. This took several hundred many attempts. In the coming weeks, I will post a tutorial on how I made it. 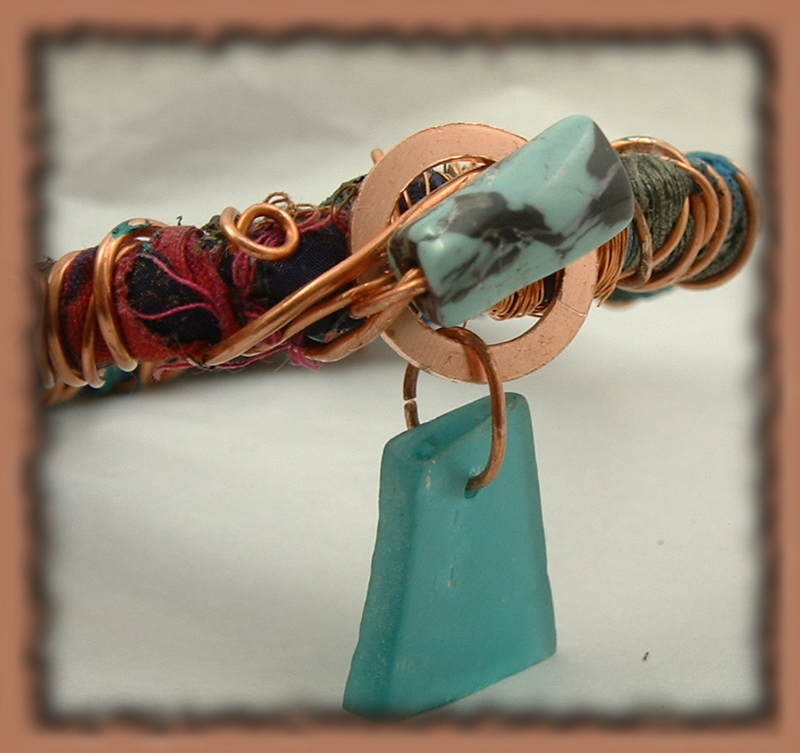 In the meantime, here are two new ideas for making your own jewelry tools! This one is great! Who uses phonebooks anymore? You can also use a thick catalog or maybe stacks of magazines. Just secure them with masking tape or duct tape. They make a great hammering surface or a cushion for a bench block. An old hammer head secured in a vise makes a great metal forming tool. I am so cold today! Yesterday I had to go out in a whirling snowstorm to deliver a sick portable hard drive to the computer hospital. Today, the computer doctor called me with the happy news that the files on the drive would live. I feel like I dodged a bullet. 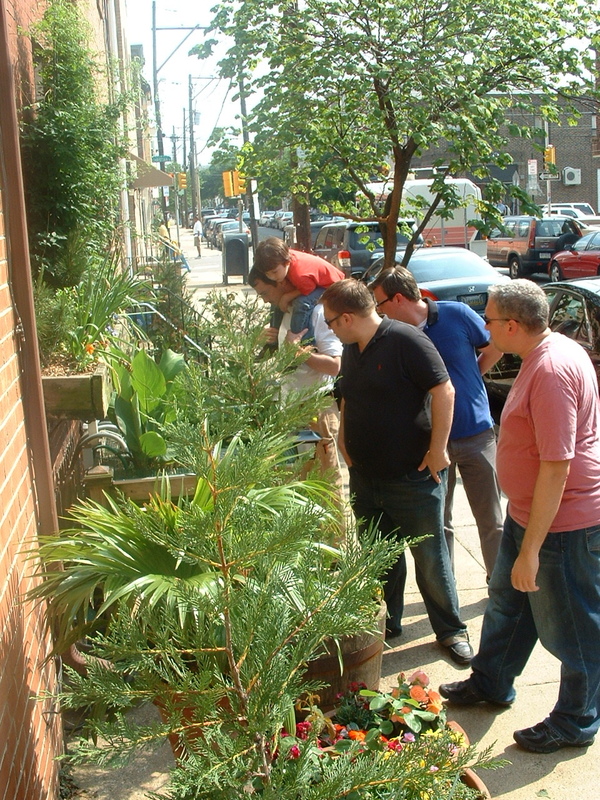 Fortunately, I already had the pictures for this blog post ready to go. Which brings me to the Resource Exchange. 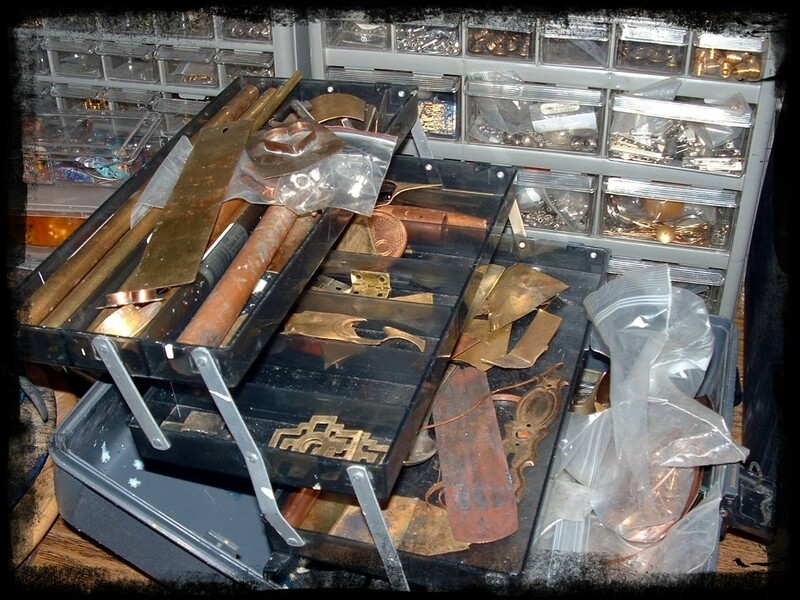 I heard about this wonderful place a couple of years ago as a space where film and play companies deposited their leftover props and set equipment when production was finished. Then I leaned that the collection of leftovers had grown to any kind of material that could be used to make art. Which includes everything when you think of it but we won’t go there, will we? No, the Resource Exchange offers all kinds of reclaimed arts and craft supplies that you can mention in polite company AND use to make art. These supplies would otherwise end up in the trash. The Resource Exchange gives them new life. 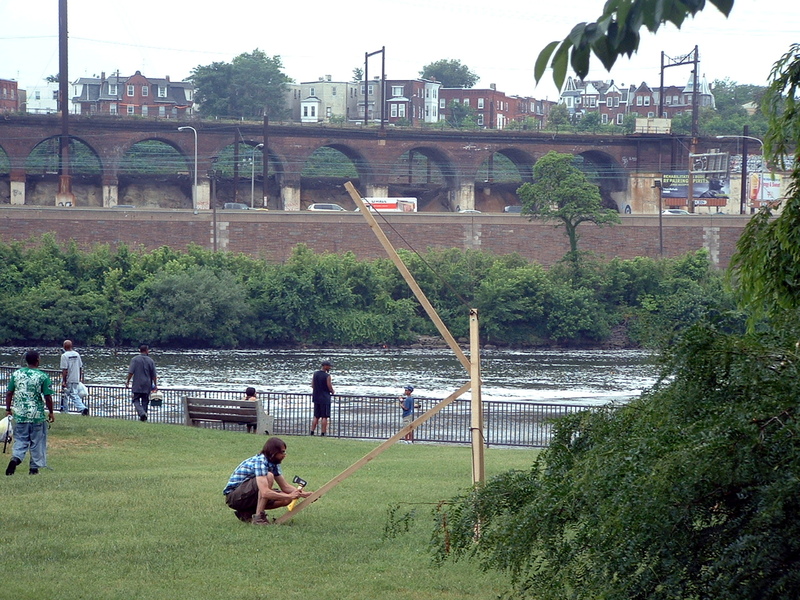 Let’s see, conservation, art, creative reuse-looks like a win/win situation to me. 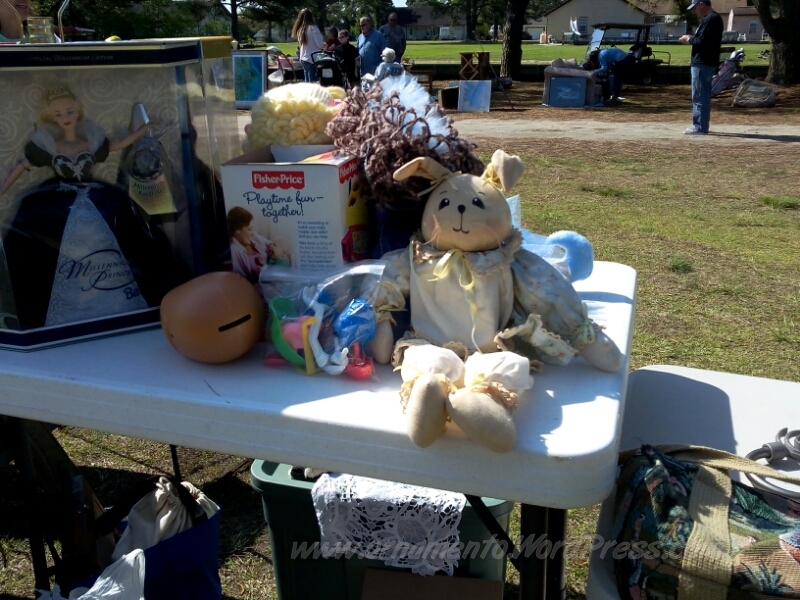 And if you have a bunch of discarded art supplies, builder supplies, tools, and old sewing machine, a stuffed animal, a bolt of cloth a case of paper clips, bring them to the Resource Exchange. Someone, somewhere will want them. On my trip to the Resource Exchange, I found some bead storage boxes, jute webbing that I used to Boris-proof my foot stools, gold thread, giant wooden beads, and some more things that I can’t remember-all cheap and in good condition. Beading Yoda was thrilled because now she has a place to bring all her Strawbridge and Clothier Bags because the people at the Resource Exchange know the difference between trash and vintage. Be sure to check out the Resource Exchange’s web page and follow them on Facebook. In the meantime, here are some enticing pictures. Not much to say this week. 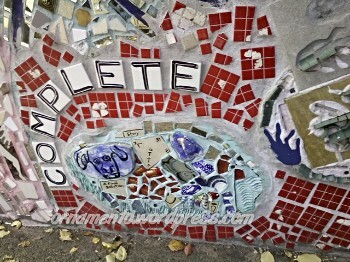 Just some pictures of a lovely mosaic installation I encountered one afternoon on my way to the Post Office at 10th and Dickinson Streets in South Philadelphia. 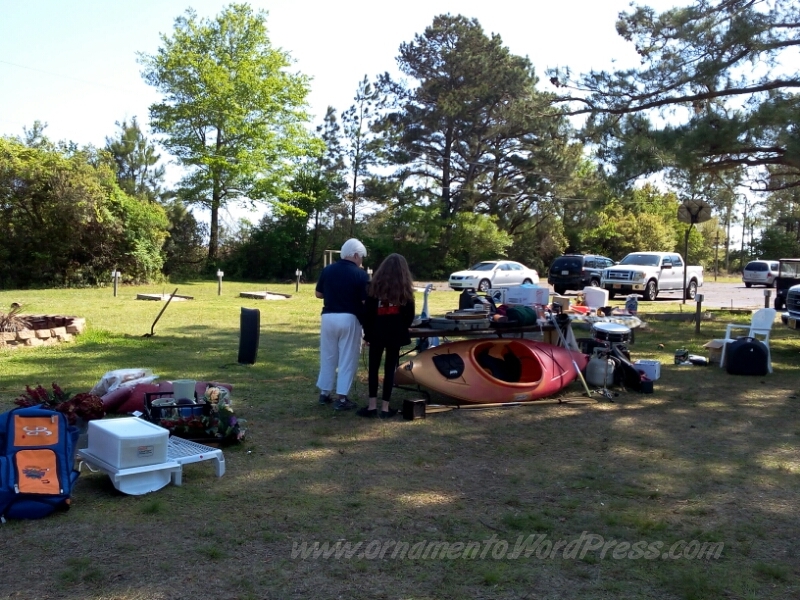 One of my favorite activities is trolling garage and yard sales so I am very pleased that Maxwell married into a family where “garage sailing” is an honored past time. I know that the correct spelling is more likely garage “sale-ing” but I like the idea (and the practice) of sailing from sale to sale. 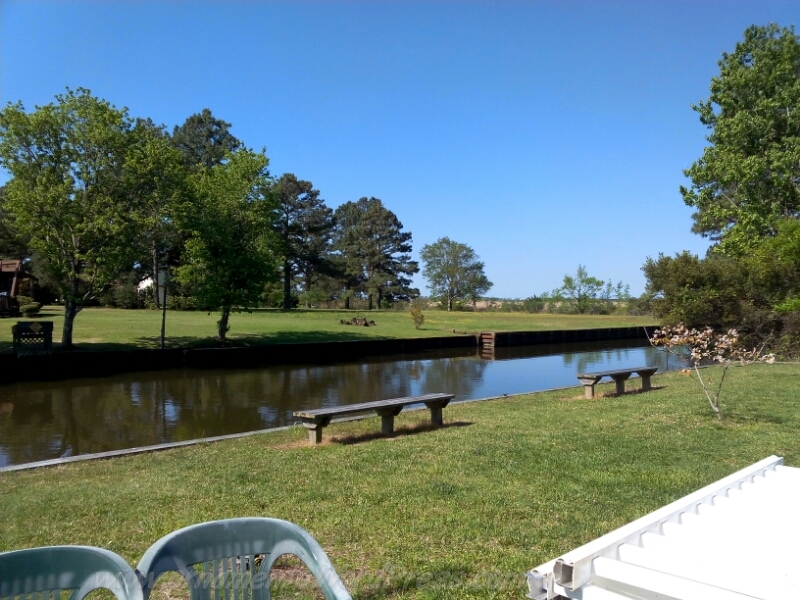 I bet you could garage sail right down this canal. The lady on the left worked as a music therapist and was selling a bunch of instruments including an Ovation acoustic electric six string guitar that was a little dinged up on the front but had a nice sound and a finger-friendly action. For $100.00 I was thinking about buying it but I don’t play anymore didn’t have anyone old enough to give it to. She also had an auto harp, an electric keyboard and a portable percussion set. I did score a Dremel rotary kit from her for $20.00 and it works great! 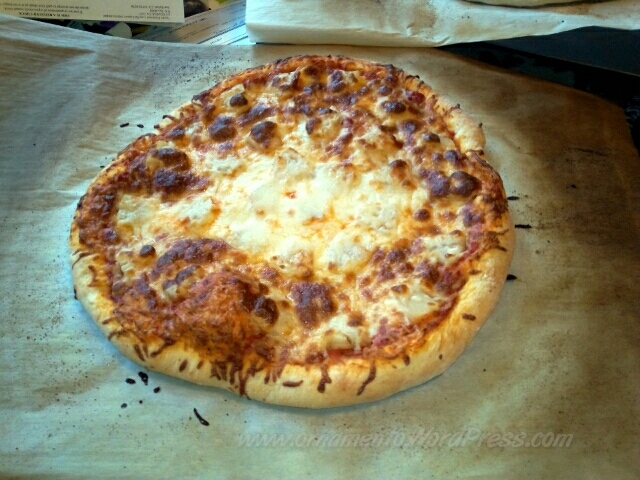 Max treated us to pizza made with his personal home made dough and toppings. A nice finish to a day of garage sailing. I’ve been a little scattered these past months last through months jumping from beading to quilting to casting glass to polymer clay and crocheting without much focus. I’ve also been practicing my soldering and playing “let’s put that through the rolling mill and see what happens.” Or arranged components in different combinations to see how they look. 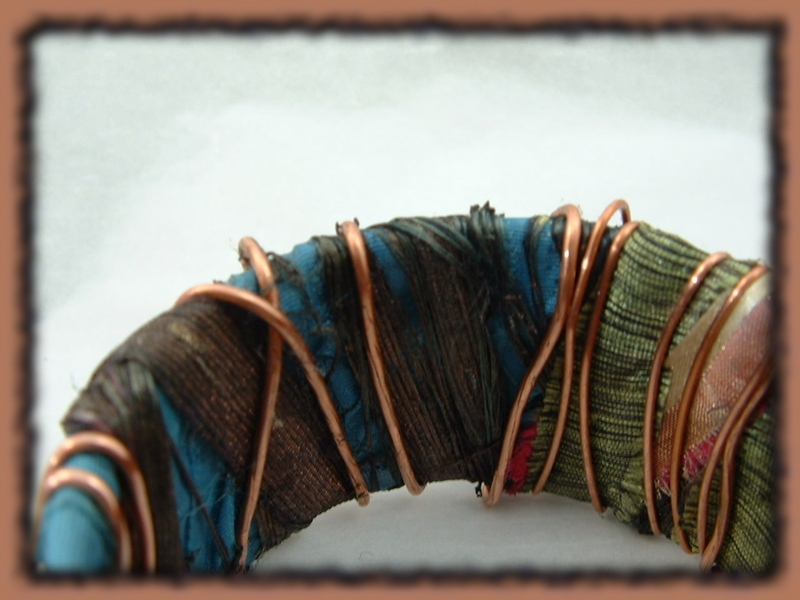 The picture below shows a copper spiral I put through the rolling mill, some bent wire, and an enameled metal scrap. I don’t think the pieces go together, but you don’t know until you try. 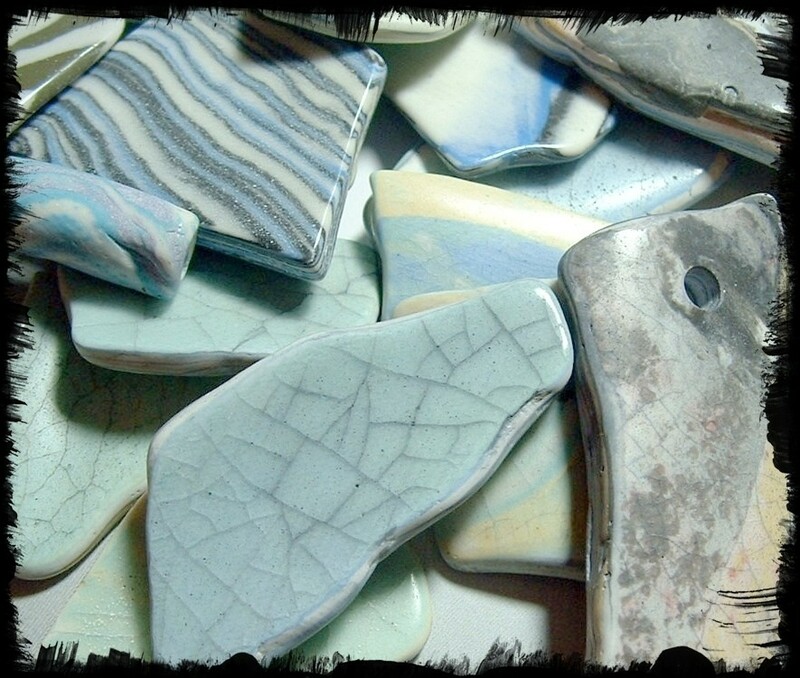 Here are some ceramic shards from my pottery days. I used high fire white porcelain with mason stains to color the clay. I had previously tumbled the the with cheap cleanser until the surfaces were a buttery matte. A couple of years ago I took the same shards and tumbled then with the polish meant to be used in the last stage of rock tumbling. Boy was I surprised-they got glossy shiny. Some shards were finely crazed on the surface and I rubbed ink and shoe dye into a lot of these. 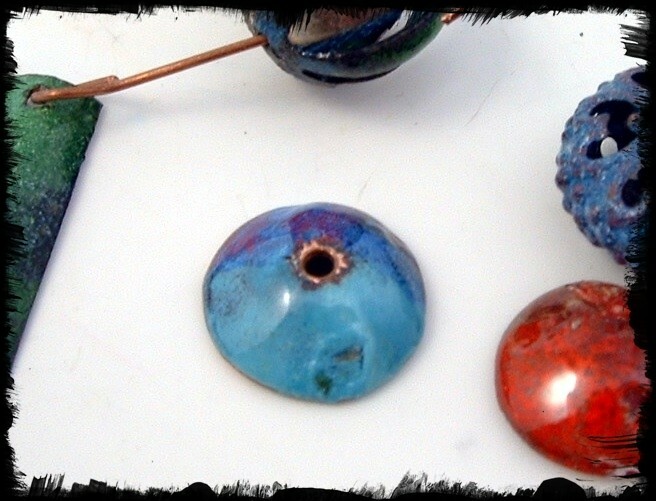 I have made pendants out of some of them; you can drill holes in them the same way you drill glass. Here are some bezels. The one in the foreground holds a bullseye glass cab I fused awhile ago. 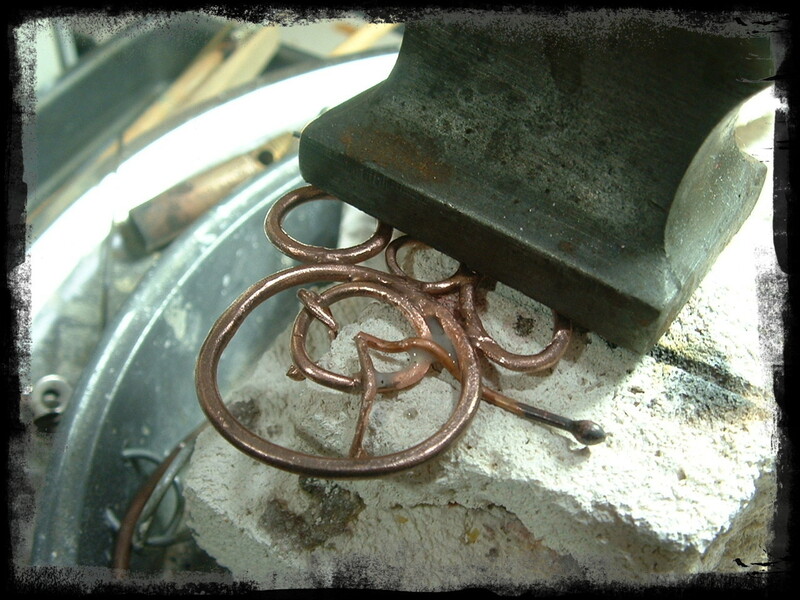 The curl of copper in the back (left) is what remained when I cut a thin sheet of copper with metal shears. The metal curls up and looks so interesting. I still have to think of a way to use these. 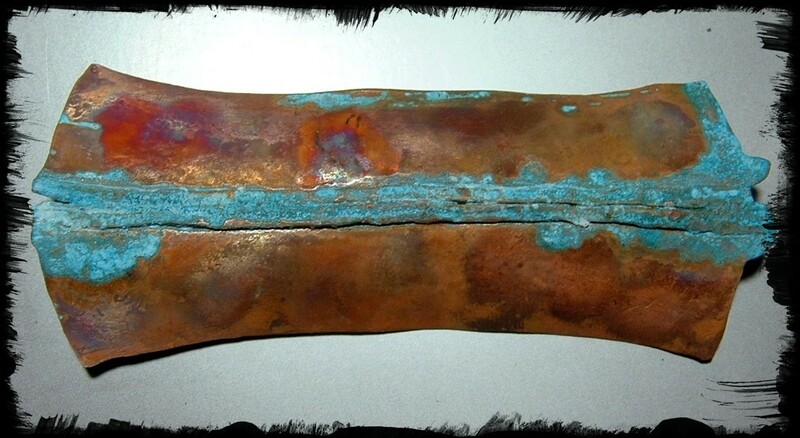 Fold forming and patina experiments. I think the verdigris needs to be toned down or eliminated. This might make for an interesting pendant. Here I am trying to hold a piece steady for in order to solder one little thing to it. When you solder, anything you use to clip or bind pieces together draws the heat from your torch and makes the process more difficult. Bead caps are easy to make. Just take a disc (bought or cut with a disc cutter) make a hole in the center with a hole punch, and shape with a dapping die and punch. More components looking for a home. The white bead is polymer clay. You enamel the bead caps after you make them. You don’t have to use them as bead caps. The above dangle could be an earring or an embellishment. A few years ago, Theresa Mowery of Patina Studio suggested Miracle Gro plant food after reading one of my posts on patina experiments. It works great! But I live in an urban area where my own garden is a weed growing out of a crack in my front steps. So I got liquid plant food that has similar ingredients to Miracle Gro ( just compare the labels) so I would not have to buy a large box of plant food and mix it up. The liquid plant food even comes with an eye dropper. 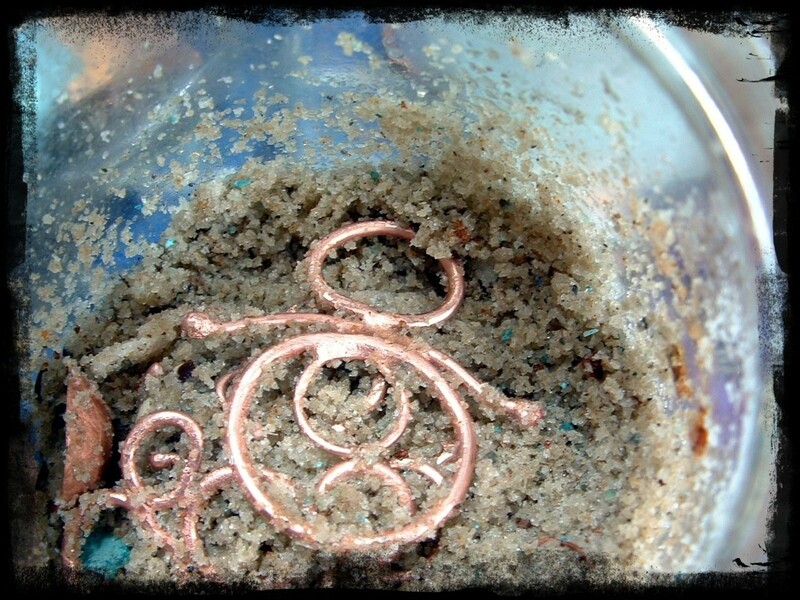 Here are some finished copper pendants tucked into my patina jar that’s filled with Kosher salt. I screwed the lid on and will check it after a few days to see how the patina is developing. Here’s some other pieces. I put on the patina and am leaving them in the open air to see what happens. 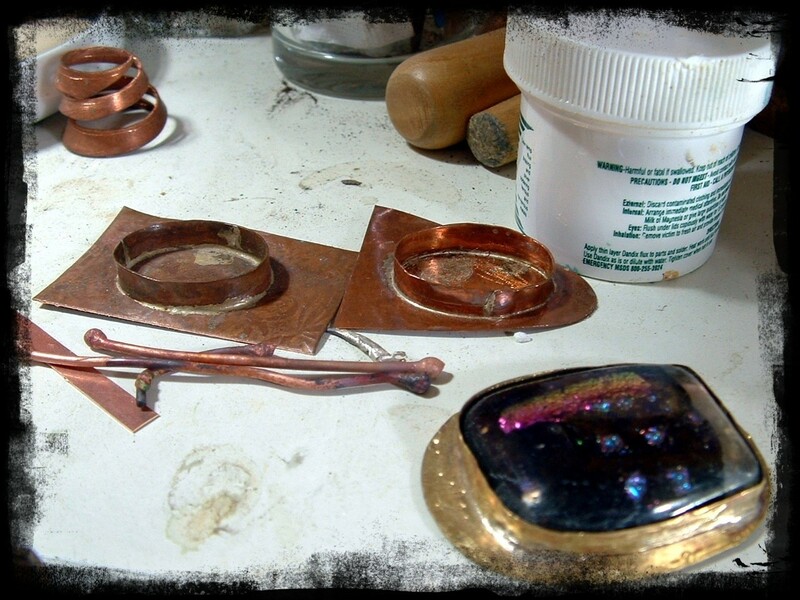 The pictures below show the front and back of a pendant in progress. I etched a piece of brass and patinated it with the ammonia and salt method. Then I cut out the shape, made a hole and shaped it in a swage block. 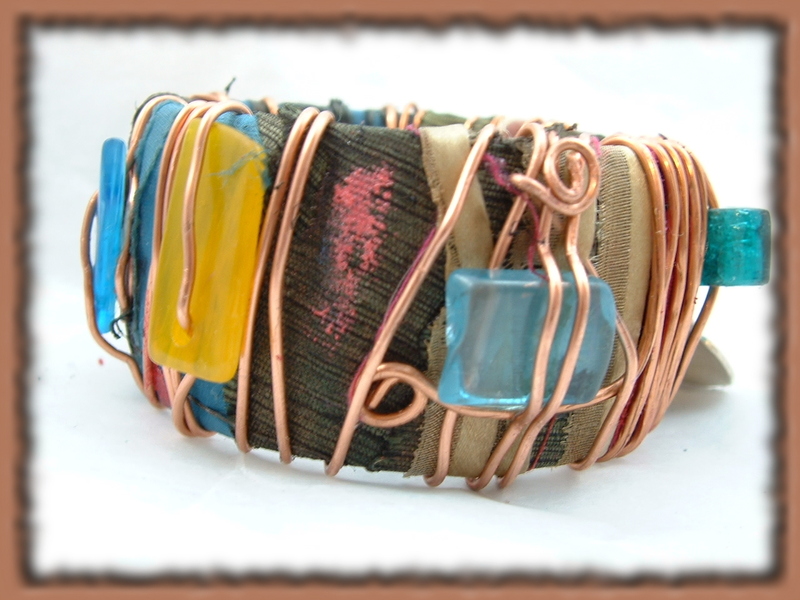 I filed the edges smooth and added a ring, washer and dangle with enameled ends. 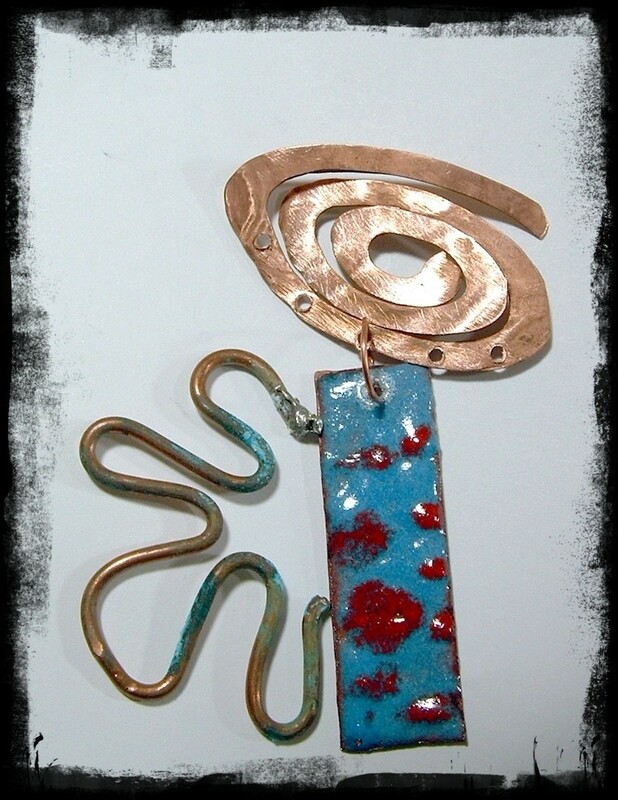 I think this pendant will undergo some more changes before I’m happy with it. 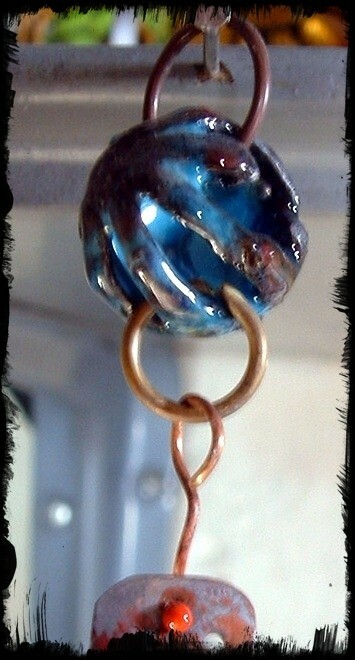 Once it’s the way I want it, I will finish the pendant with a coat of Renaissance Wax to protect the patina. I did not plan to make this quilt. I wanted new quilts or comforters for my bedroom but could not justify buying new ones when the old ones were perfectly fine and I was just tired of the way they looked. Then I started searching for the perfect duvet cover. I didn’t see anything I liked. Then I saw quilts I liked in a catalog and thought about making a patchwork design duvet cover. 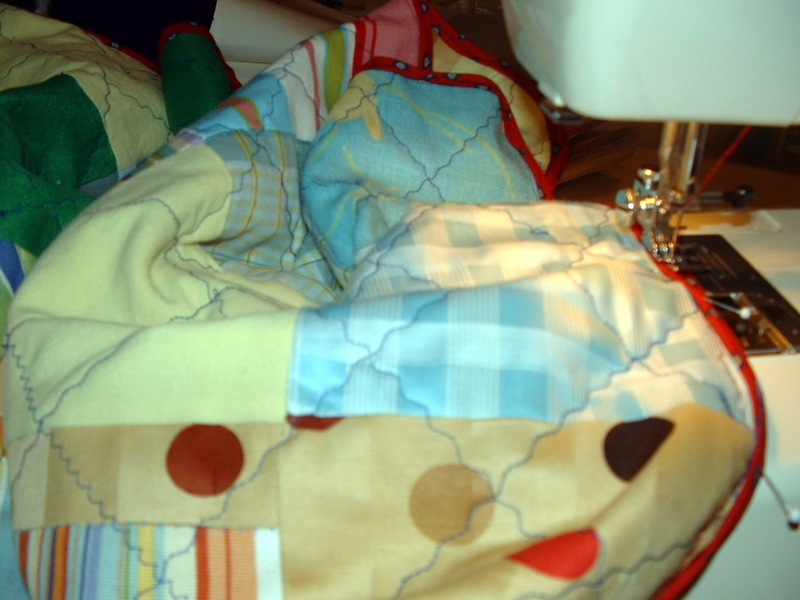 I started dreaming in patchwork and going on line and looking at quilting supplies and fabric. 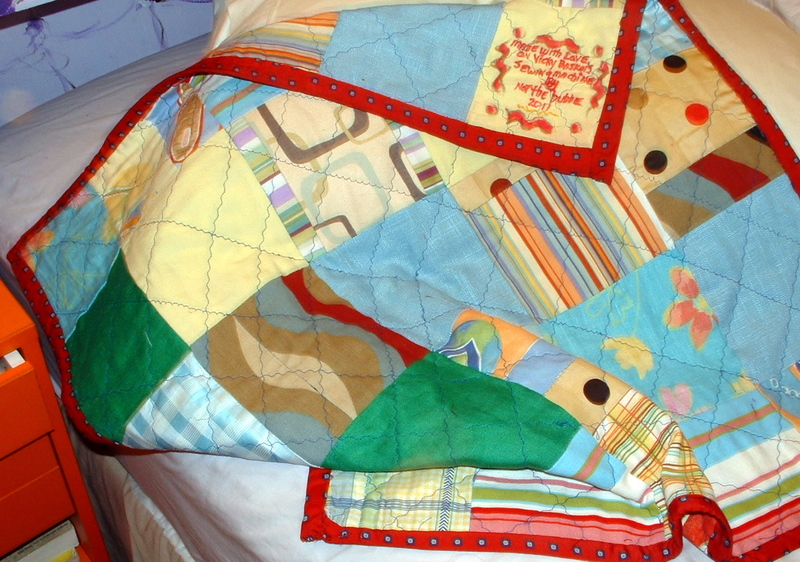 That’s when I got the idea of making quilts for my bedroom using the old comforter as the insides. Have I ever done this before? No. But the Internet is full of blogs and tutorials with information on how to do things. I read and watched videos. A lot of videos. I read books. The main idea I came away with is that a beginner (me) should start small. It was then that I remembered that a baby was due in our family in a few weeks and, if I put the (sewing machine) pedal to the metal, perhaps I could make a baby quilt. What about the fabric? I knew the little Tater Tot was a boy. I had some great fabric I found at Jo-Mar in Philadelphia, along with some Bohemian Chic style tablecloths bought at deep discount. Not appropriate for a baby boy quilt. So I went looking on line and saw all these kits and jelly rolls and charm packs with gorgeous color coordinated fabric meant to be cut and sewn together. But that didn’t resonate with me. This project wasn’t about recreating someone else’s idea; I wanted to create my own palette and I wanted to recycle fabric. So I bought old clothes at thrift stores, and raided my small fabric stash and closet. A co-worker gave me fabric that belonged to her late aunt who had made baby quilts for her family. That seemed appropriate to use. 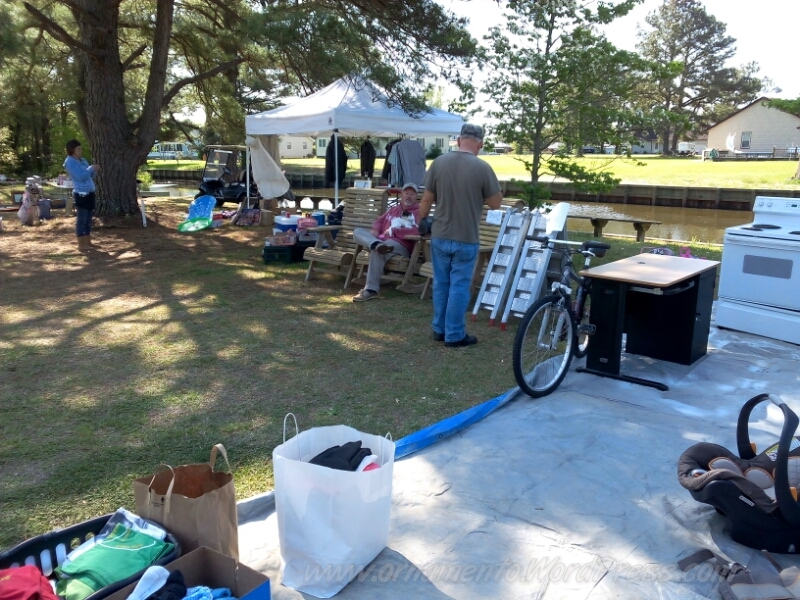 I brought everything home, washed and dried it, ripped out the seams in the clothes and ironed everything. Plumpton helped me to “audition” the colors. He took his job seriously! I decided to make the quilt five (six inch) blocks across and down and to have blocks on both sides. Because I intended to do the quilting on my sewing machine and didn’t have a walking foot, I used a baby blanket for the inner layer. My first step was to cut out 50 blocks, arrange them in two sets of 25 and sew each set together. After I completed both sides, I sandwiched the baby blanket in the middle using spray adhesive to hold everything in place and smoothed out the layers. I put in a few pins for added stability. Then I started to machine quilt. It was here that tips from two friends came in handy. I had watched one video where the quilter started machine quilting from an outside corner. “No,” instructed Jeri Beading Yoda, “You start from the center and go out.” And since I had never machine quilted anything, Susie B recommended I practice on some cheap fabric first. I’m glad I did. I used a modified zig zag stitch because I knew my quilting was going to be crooked and this stitch would sort of hide that. After quilting, I trimmed everything square and sewed on the binding. Here I am machine stitching part of the binding. I did it over about three times before I was happy with it. I ended up machine stitching one side of the binding and hand sewing the other. You can see this technique here. They say you should sign the quilt, so I did. 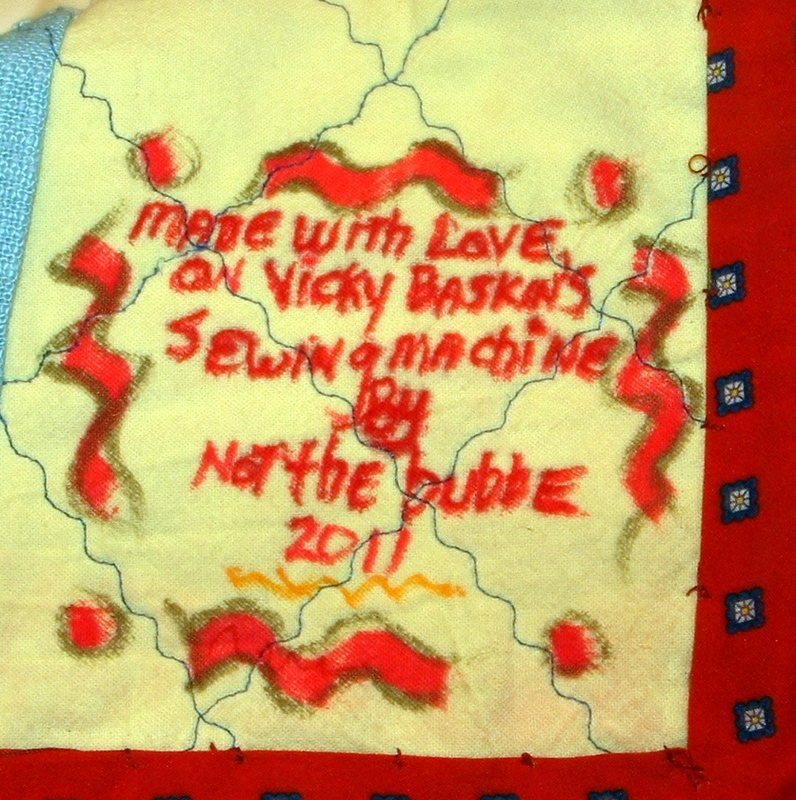 I thought it was important to mention that I sewed it on a machine that had belonged to baby’s Great Grandmother Vicky. It wasn’t until after I signed the quilt that I remembered that Vicky had made me a beautiful quilted jacket on the very same machine. Here is the finished baby quilt. “How cool,” I thought. I went to get a closer look. 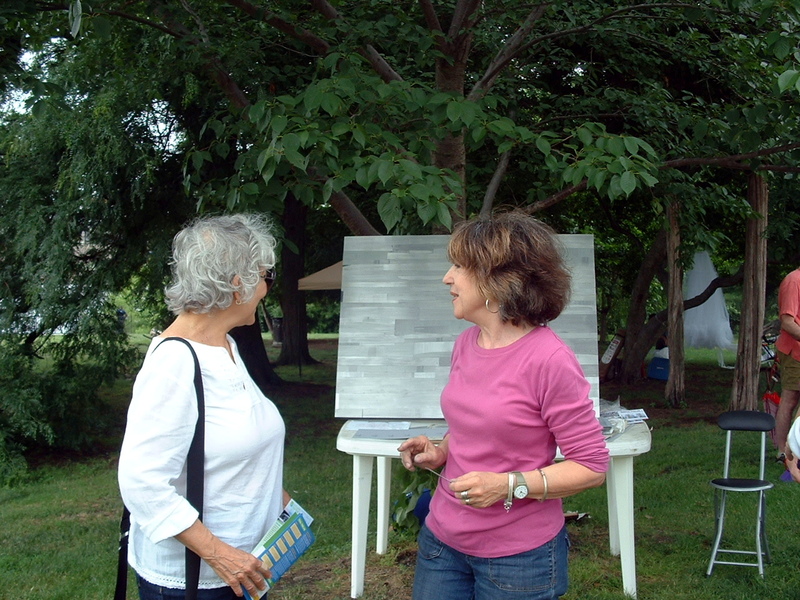 . .
and met the artist, Dolores Poacelli. 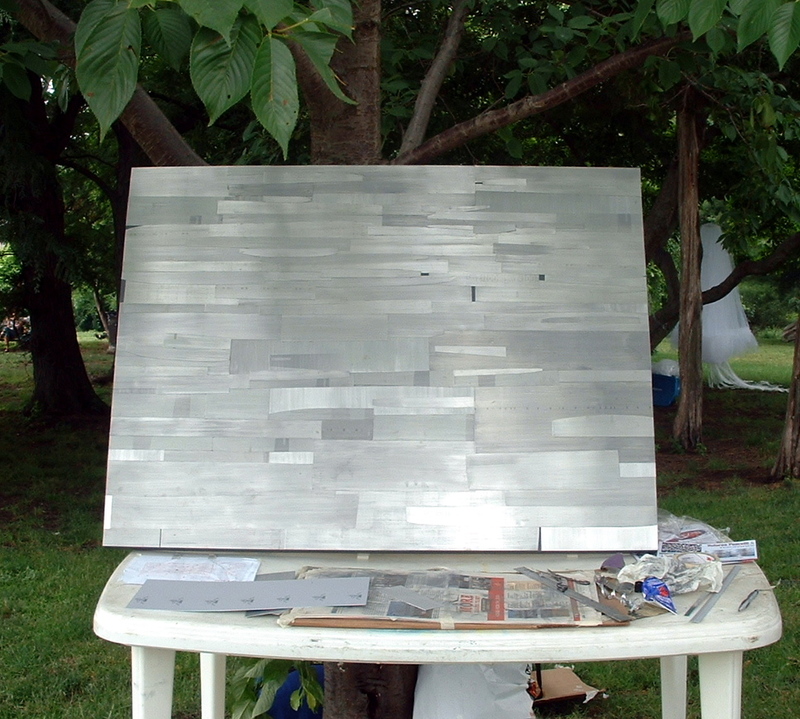 She told me the piece was composed of discarded aluminum printers plates she found in the trash. 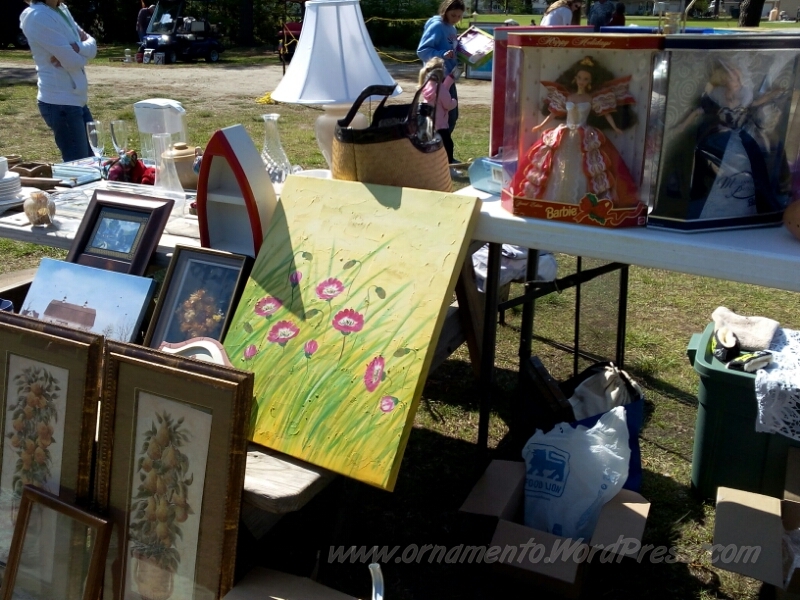 “I’m a dumpster diver,” she said, ” and my studio is in the Italian Market.” That’s all I had to hear to feel a connection. But there was something else that attracted me to her work. What? The unifying factor in her body of work is an ongoing exploration of the relationship between color, shape, texture, space and tension. 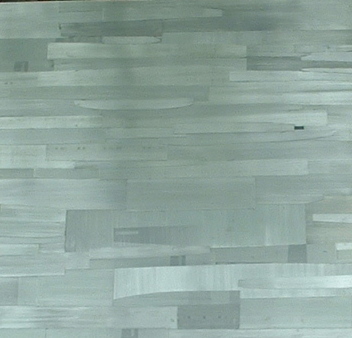 Her exploration of these elements, while subtle and nuanced, animates the monochromatic piece and makes it interesting. Want to see more? 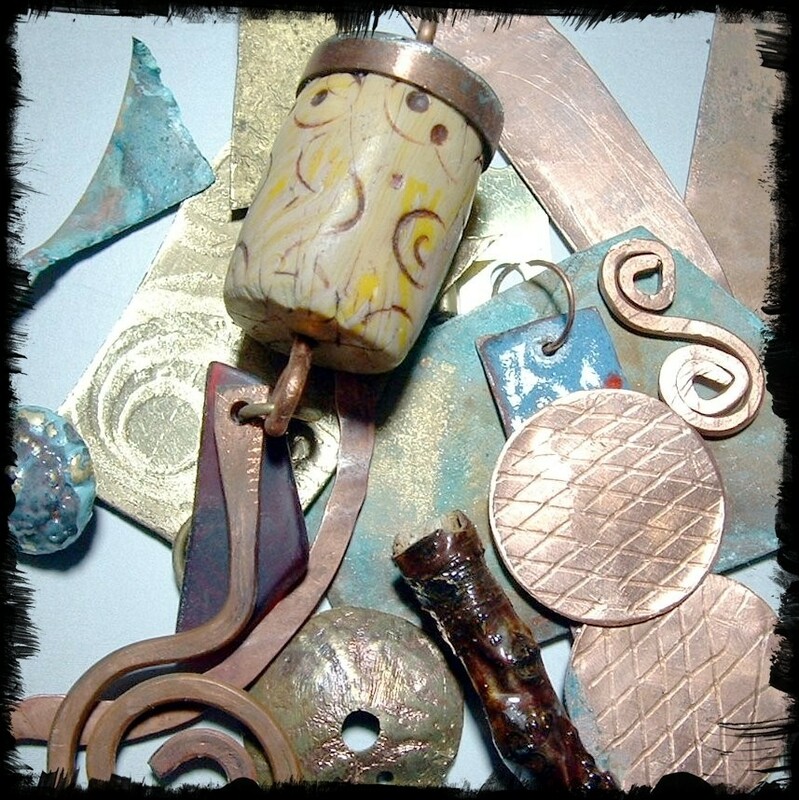 Her web site is full of compositions where she studies these relationships in metal, paper, collage, paint and mixed media. Take a look! Press here to see more of Poacelli’s work. Passers By look into the koi pond. It’s early in the season, but Bob’s garden is already underway. There are new fish in the koi pond, a big, happy turtle, and lots of new plants. Barbra chewed off her perch in the tree, so Bob made her a new one. Enjoy the slide show. One theme I try to address in this blog is how the history of world events (think of the history taught in schools) and personal and family history affect the creative process. The story of Nomge’s creation is an example of world events and personal history converging into art. In Nomge’s case, however, the world history is African-American history which is still not uniformly taught in schools as the integral part of American history that it truly is. Nomge is the work of Philadelphia artist, teacher and activist Maisha Sullivan-Ongaza, who first traveled to the African continent to visit Nigeria and Kenya more than thirty years ago. That trip was the first of a regular series of travels to countries throughout Africa that she continues to this day. 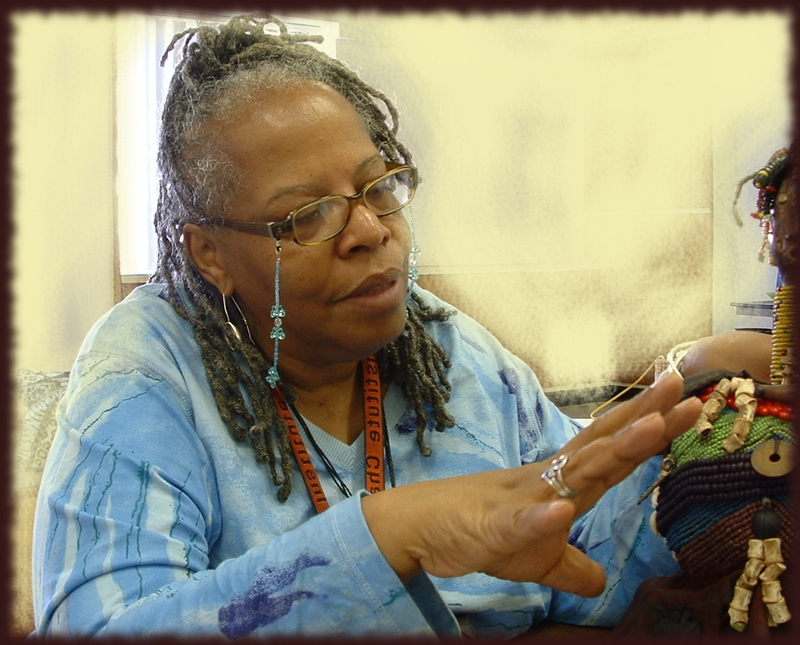 Along the way, she developed a vast expertise in African culture and history that she used as host of a local radio program, “Fertile Ground.” But sometimes the most important journeys we make are the inner ones. I think that’s what led Maisha to create Nomge. Most artists have the itch create. Sometimes this urge kicks into overdrive: ideas that might have laid dormant within the artist for years start to resonate and insights seem to come from nowhere. 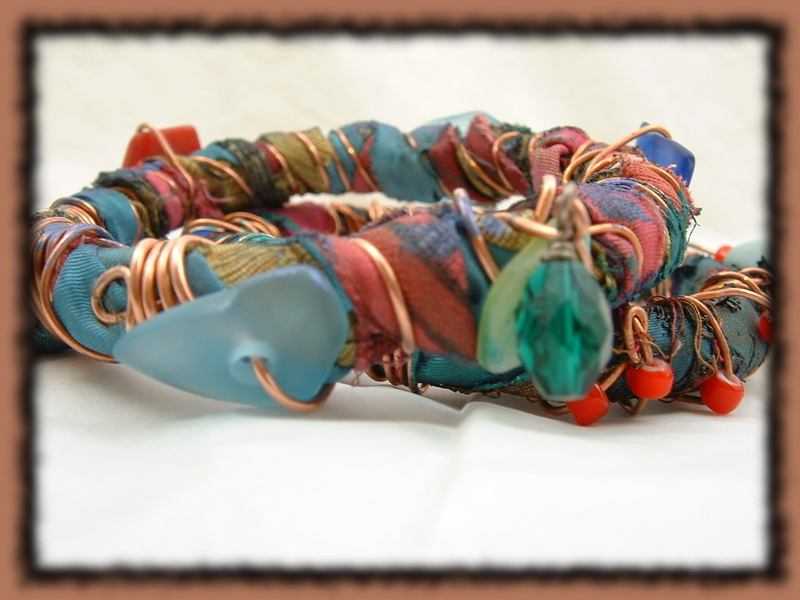 Materials such as fabric, metal or beads might start “talking” and telling the artist how to use them. 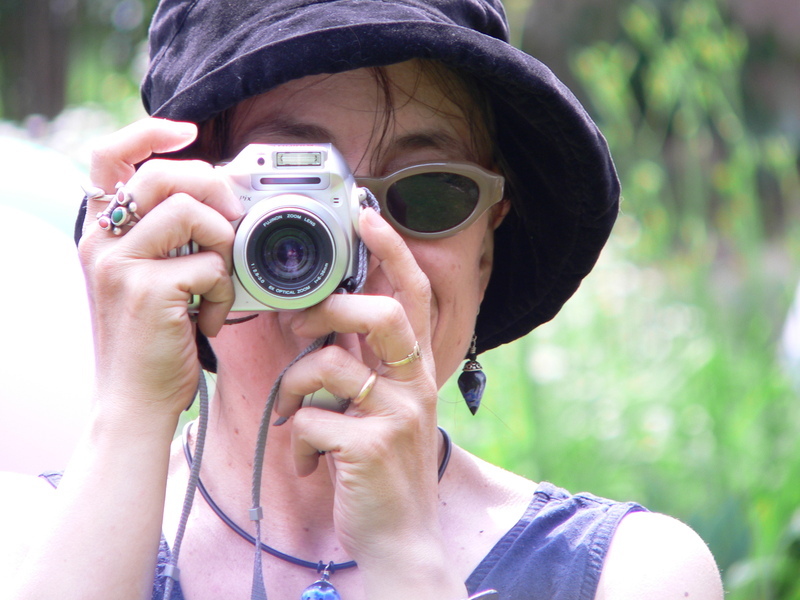 The experience often makes the artist feel like an external force has taken control of her and that she is more instrument than artist. The process can seem almost religious, but I think it is a result of ideas, memories and emotions lurking in the subconscious and spewing forth almost uncontrollably at the point when the artist is ready to give them a voice or form. I don’t think my rationale makes this process any less miraculous. Four years ago, Maisha decided to have her DNA tested to learn about her African forebears. She found out that her that her maternal ancestors were Bamileke people who came from Cameroon, a little country tucked next to Nigeria on the West coast of Africa. Knowing the country your ancestors came from is something many people take for granted. But for those who have lived all their lives with a with a hole in their family histories, the discovery can generate powerful emotions and, for those who have the courage, an invitation to embark on a path of self discovery. 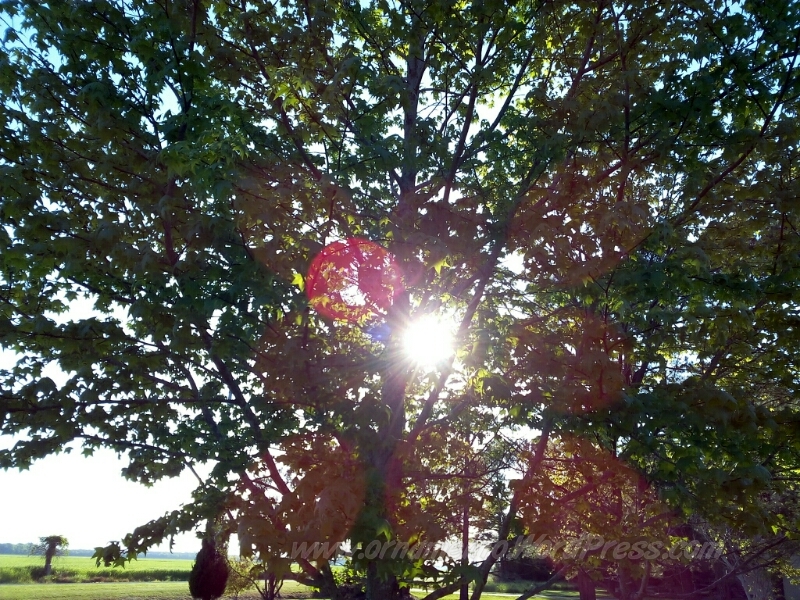 Art can help the process because it is a constructive, therapeutic way to express feelings. And all over the world, it is a traditional method of paying homage to an ancestral legacy. From what Maisha told me, I can’t help but believe that at least some of these elements came together and compelled her to create the Cameroon-inspired Nomge who is named after one of the more than 250 ethnic groups who live there. 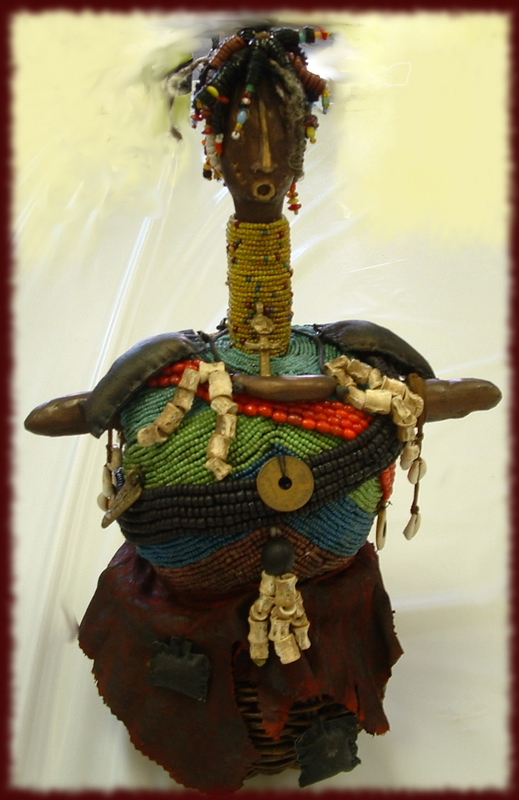 Maisha started with a “T” shaped wood armature and anchored it in an old Gullah basket she lined and filled with plaster. She sculpted Nomge’s head and arms with Ultralite Sculpey colored with pigment. 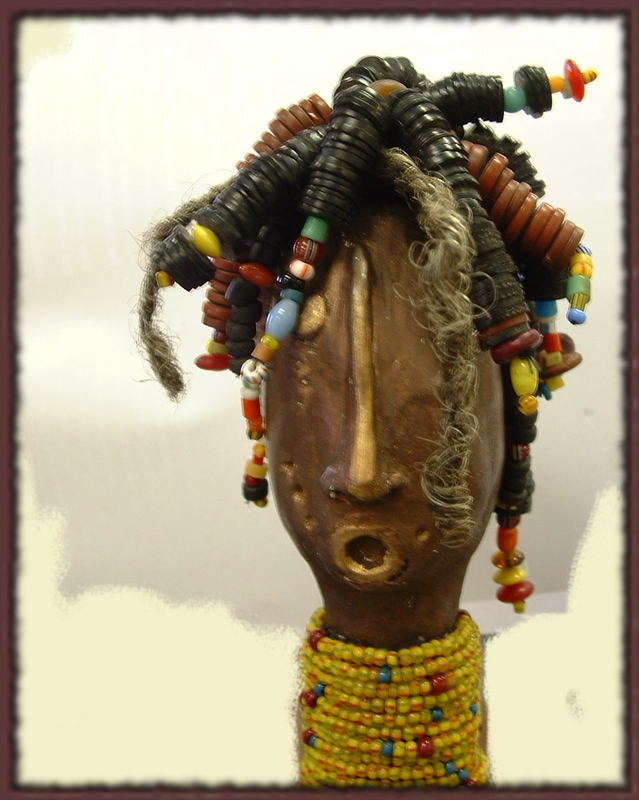 Nomge’s hair is a combination of cocoanut shells, heishi, bauxite shells, and strands of Maisha’s own hair. 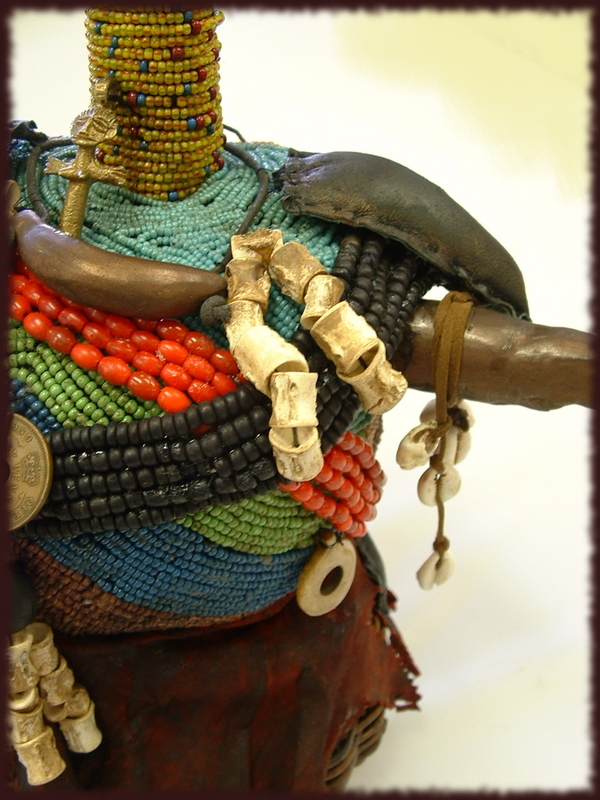 Maisha obtained the vertebrae beads on her first trip to Nigeria. She does not remember what animal they are from-possibly a snake. She stained them with walnut ink. 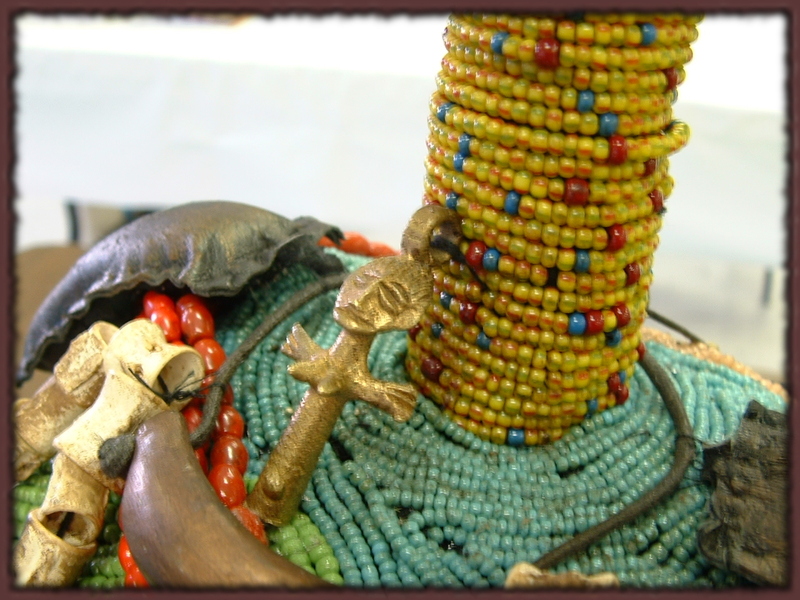 Nomge’s necklace is made from African trade beads. 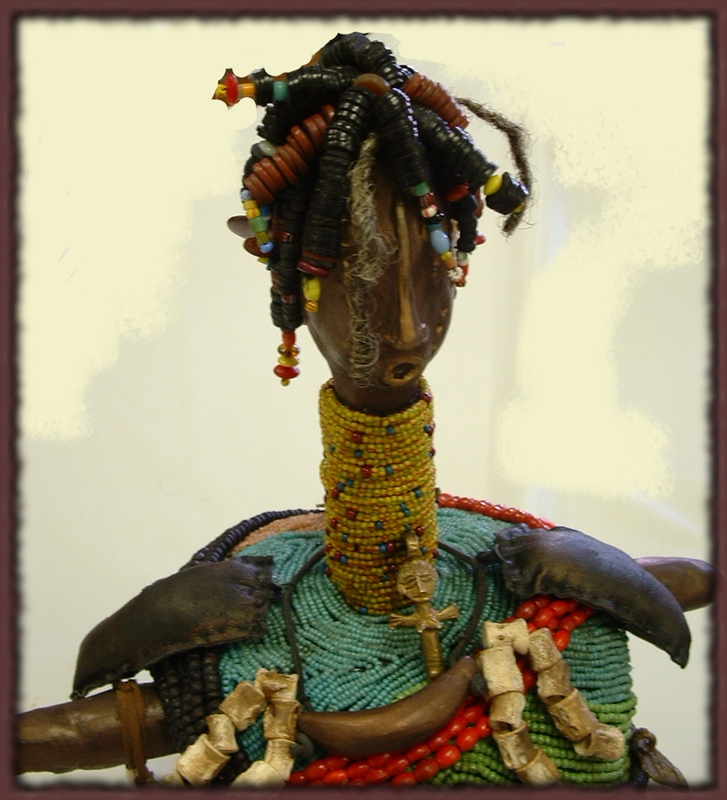 Maisha made Nomge’s body soft so she could bead on it, and she used beads from her travels collected over the years. The bronze pieces are from Nigeria. The coin on the front with the hole in the center (see top picture) is from 1957 when Nigeria was still a British colony. The leather shoulder pouches are inspired by Gri Gri from West African culture. Gri Gris are talismans normally filled with prayers and protecting, healing herbs like Echinacea and golden seal. 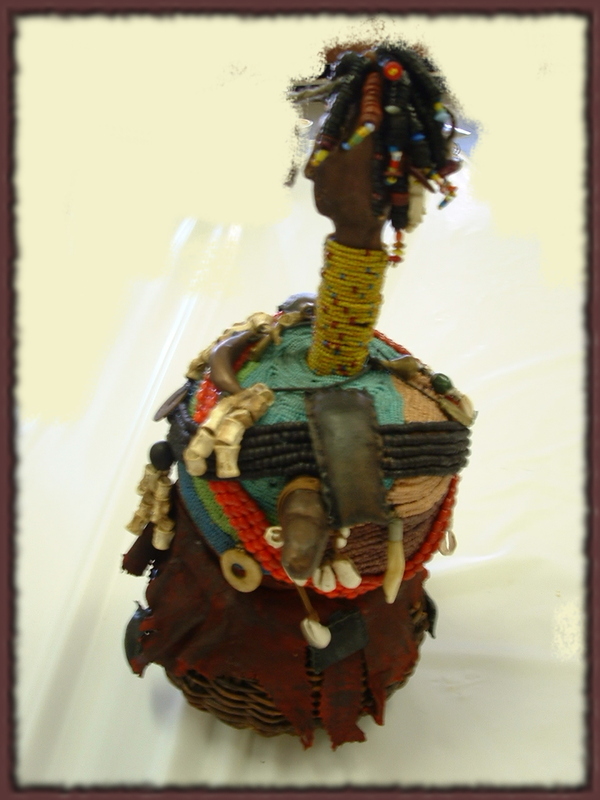 The Gri Gris on Nomge’s shoulders contain the names of Maisha’s ancestors and children. There is an African saying, Maisha told me, “Thanks are due to the shoulders who hold the head high.” The Gri gris are meant to honor her ancestors without whom she and her children would not be here to contribute to the world. The smaller Gri Gris on Nomge’s sides contain the names of the children Maisha works with in her program along with lemon rind and honey, because life can be bitter and it can be sweet. 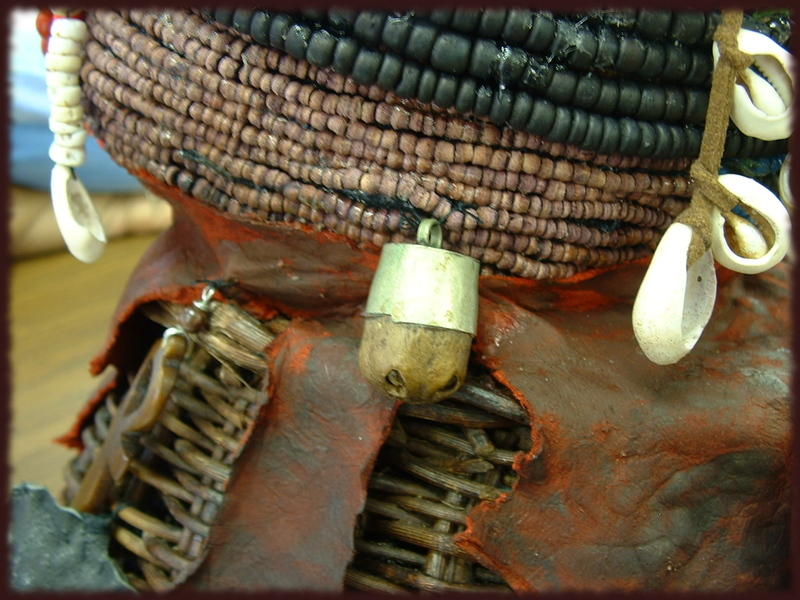 The various bone pendants and amulets belonged to Maisha’s late husband. The red leather ( stained to age it) comes from a jacket that Luther Vandross owned and wore on his “Power of Love” tour. Maisha’s friend Dzinga was Luther’s first cousin and gave Maisha the jacket after he died. It has found new life in Nomge. Nomge’s final instruction to Maisha was that she would be finished in 2010, and she was. Maisha put the last bead on her on New Years’ Eve, 2010. I suspect that Maisha carried Nomge inside for years until the series of events she related to me ended with Nomge’s arrival in her house on New Years Eve, 2010. It must have been a joyful event when Maisha welcomed Nomge home. 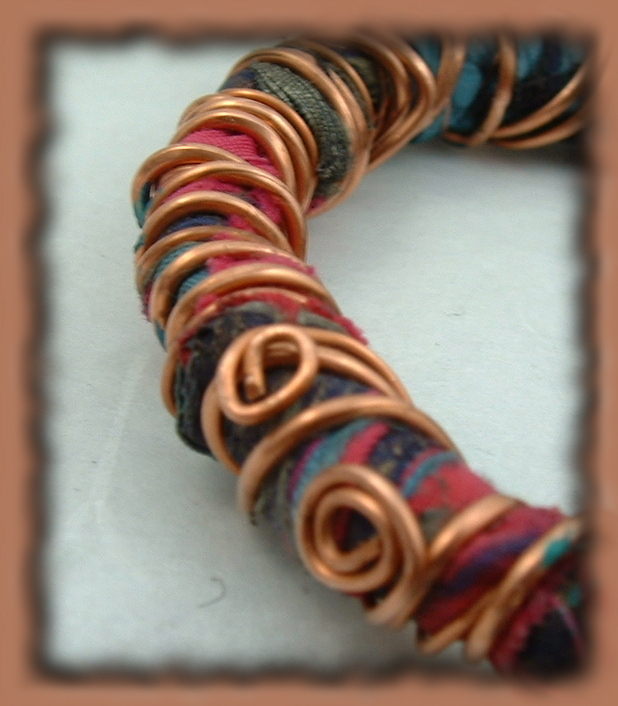 I have been exploring textile arts and learning techniques for incorporating them into jewelry. And making up a few of my own. 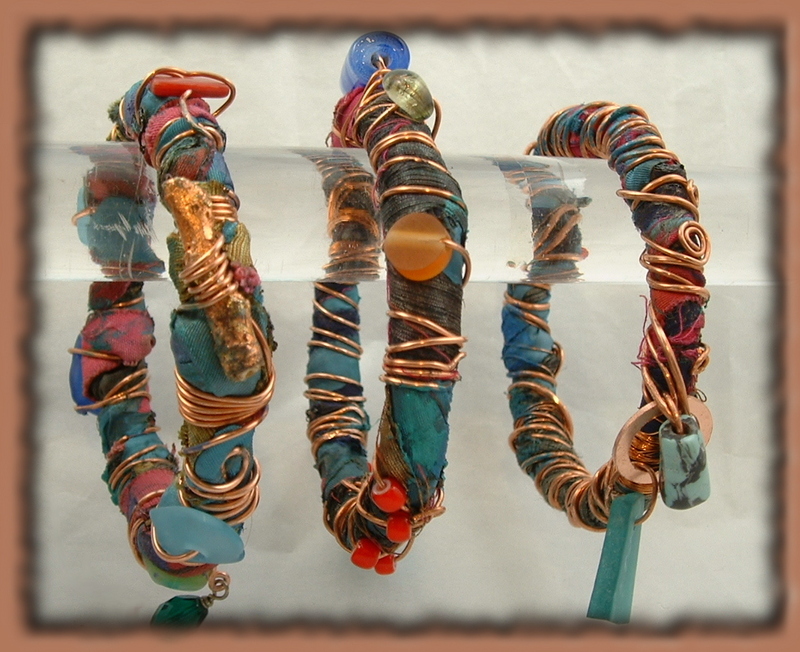 The bracelets below are from recycled materials: old clothing dyed, stamped, painted and shredded, cast off electrical wire stripped and straightened, scrap stained glass tumbled and drilled, some gilded twigs from the sidewalk, pieces of old jewelry, and old plastic bangles or wire forms, There is no plan; I just start to wrap and embellish. I hit some of the bracelets with a heat gun to see how it would affect the fabric. 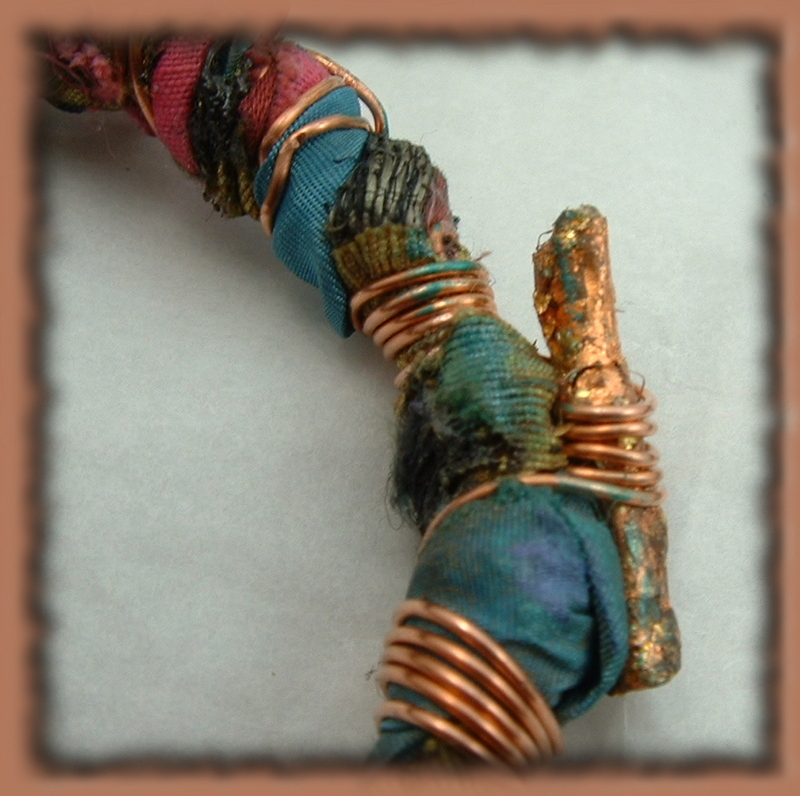 Depending on the fabric, it will burn, seal the frayed edges, or melt the fabric to reveal what’s beneath. 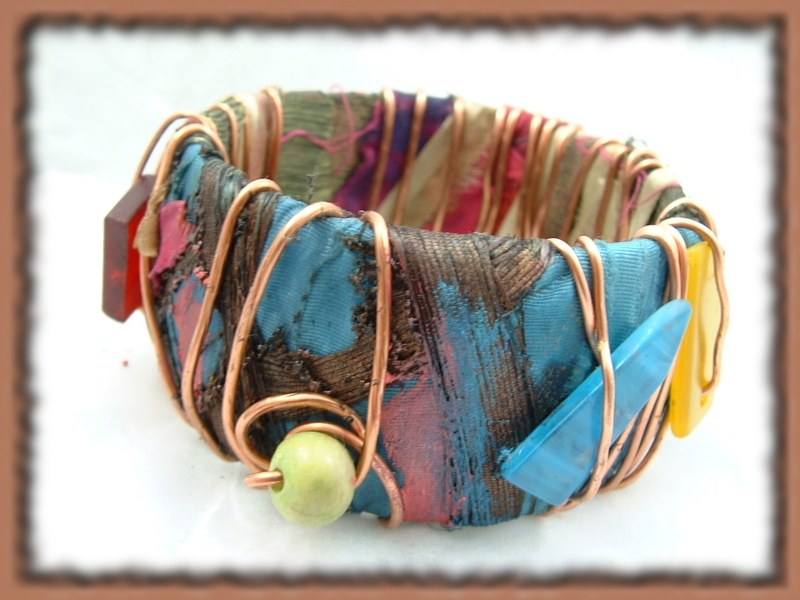 I got this idea from a video by Textile and Mixed Media Artist Maggie Ayres. There is so much information out there. Don’t limit yourself to what you already know or think you have to take a class (unless you are learning how to use a torch, or another technique where proper safety instruction is vital). Don’t be afraid to try something new!